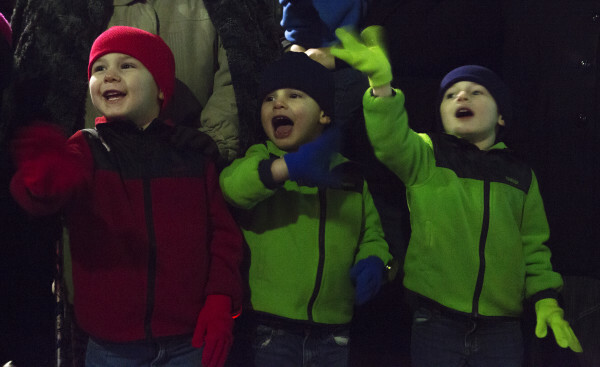 Landon Mailman (from left), 4, Braydon Mailman, 3, and Colton Mailman, 3, wave and yell "Merry Christmas" as floats go by during the annual Bangor Festival of Lights Parade and tree lighting Saturday in downtown Bangor. 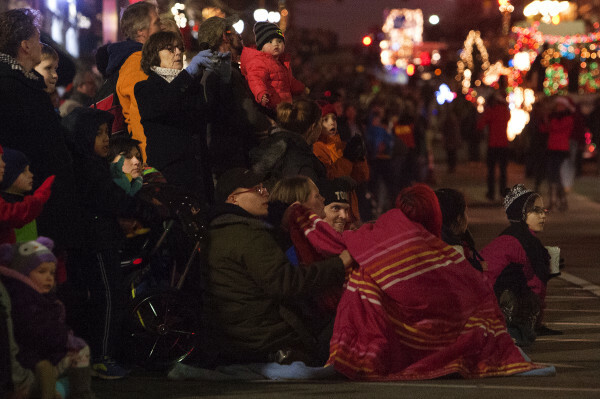 People watch the annual Bangor Festival of Lights Parade and tree lighting Saturday in downtown Bangor. 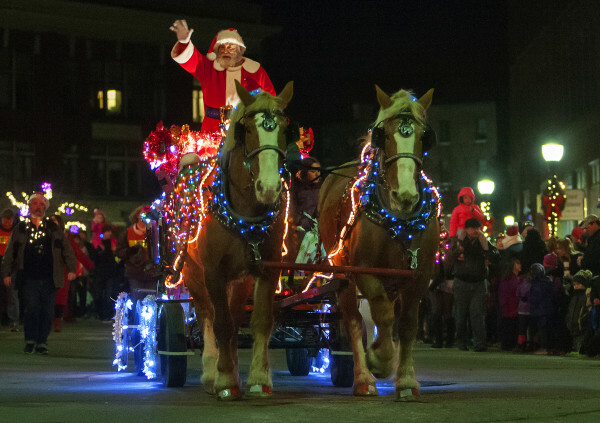 Santa Claus waves to the crowd during the annual Bangor Festival of Lights Parade and tree lighting Saturday in downtown Bangor. 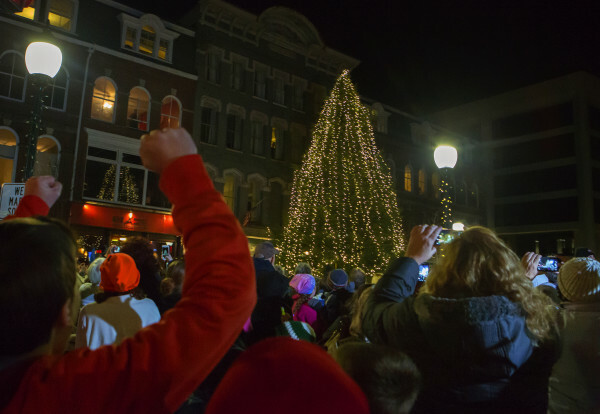 People cheer as the lights of the Christmas tree go on Saturday night in downtown Bangor. 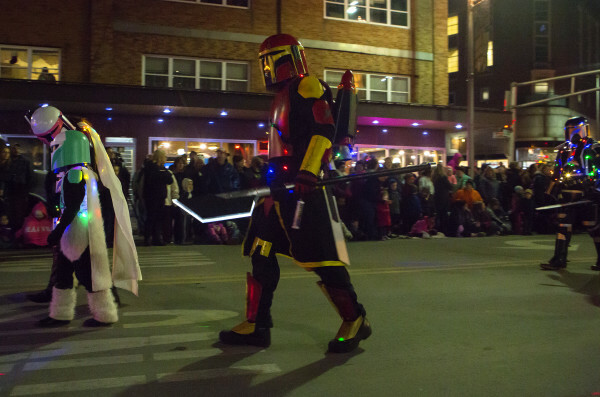 "Star Wars" characters march during the annual Bangor Festival of Lights Parade and tree lighting Saturday in downtown Bangor. 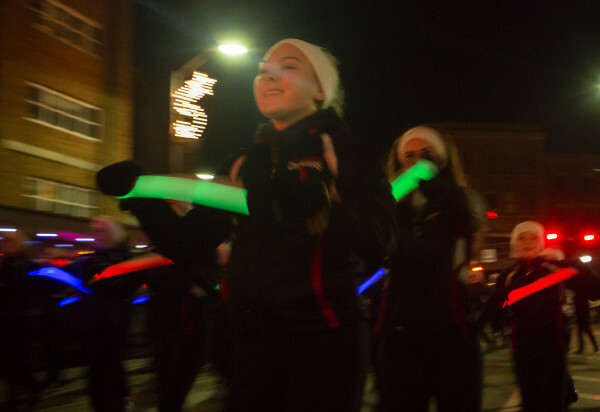 Dancers preform during the annual Bangor Festival of Lights Parade and tree lighting Saturday in downtown Bangor. 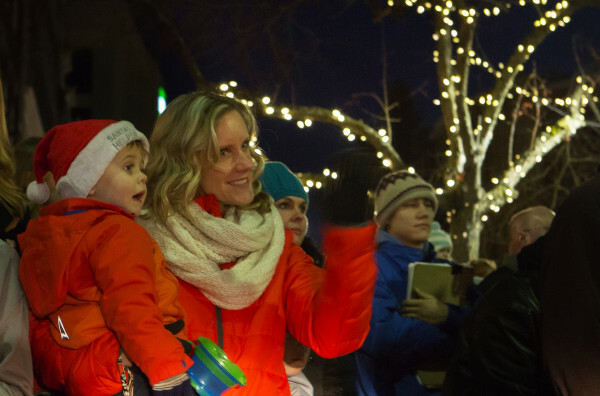 Renee Love (center) points out floats to Reece Geiser, 2, during the annual Bangor Festival of Lights Parade and tree lighting Saturday in downtown Bangor. BANGOR, Maine — Seven-year-old Georgia Marsceill took Saturday’s Bangor Festival of Lights Parade as a personal challenge. Besides wanting to behave well for her grandmother — Santa is always watching, especially at this time of year — and to keep her two sisters in line like any older sister would, Georgia needed to overcome something: Her fear of clowns. While it’s probably quite a stretch to say that Georgia is coulrophobic, she did say that the last time she saw clowns, they scared her. “I don’t want to be scared of them,” Georgia said solemnly as her sisters, fraternal twins, 5-year-olds Piper and Ziba Marsceill, looked on. Georgia didn’t get a chance to test her courage, possibly because the parade didn’t appear to have any clowns, but as holiday parades go, it had a whole bunch of most everything else. Seventy floats from central and northern Maine participated in the parade through downtown at dusk on Saturday, Roland Narofsky, chairman of the Bangor Rotary Club’s parade committee, said. The lighting of the tree at West Market Square followed the parade. Narofsky was thankful that this year’s parade suffered none of the snowy weather that aborted the 2014 effort. Crowd estimates weren’t available, but Narofsky said the event draws 10,000 to 15,000 people annually. This year’s parade had some new features. Several businesses — Bagel Central, the Charles Inn and the Maine Discovery Museum — held events indoors during the parade, Narofsky said. “We want to expand our downtown community involvement to make this event more than just a parade,” he said. The Marsceill’s grandmother, Janet Trowbridge, said the parade has been something of a blessing for the way that it engages her granddaughters. Correction: A previous version of this story incorrectly stated that the city’s tree is in Pickering Square.